The table-order below is easy to change by clicking / tapping on the desired name (Date, Media-sort, Title or else). It assists to find desired search terms quickly. For more information about of this page, please read here. Click / tap on the thumbnail above to magnify the explanation of the navigation functions. Opening/dragging images, pdf files or float boxes around and listening to the music simultaneously is supported. To change the order of the list of compositions, please click/tap on a column name on top of the opus-list. Otherwise use the built-in "search function" on your own device to quickly highlight your desired instrument or instrumentation below. 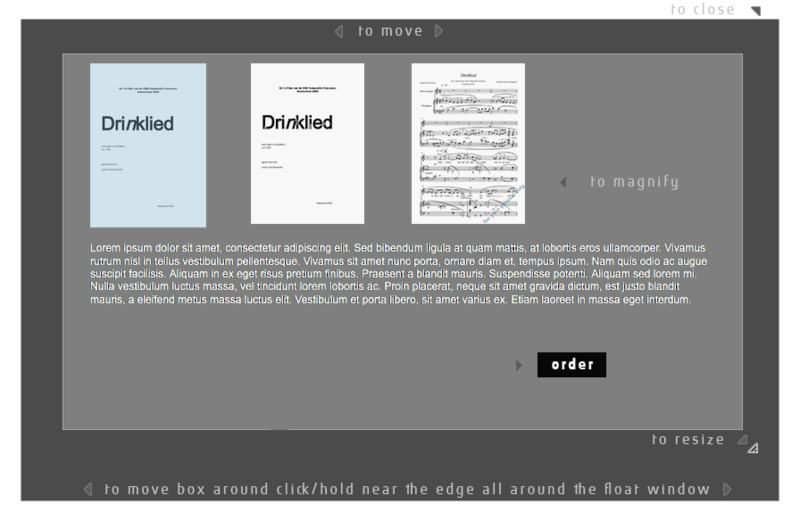 By clicking on each composition-title a float box (like the one you are reading now) will open and you can discover full information about the piece, a.o. the cover, preface, a score-example, full list of the instrumentation, some other media and more. By clicking/tapping the column Genre, you can quickly view the list of used instrumentation (only if applicable). The used abbreviations are listed below. To order a score, please use the ORDER button, a new window from our web-store will open. Occasionally you can also listen recordings through additional music distributors, in that case the links will be provided below the detailed page. - our excuses for this inconvenience. Ensemble size: at least 24 singers because of many divisi and soloists from the choir. - 2x pedals (switches) like sustain or other triggering devices, like sensors/buttons etc. The piece is composed to use fixed media (or samples) with it that are cutted in smaller portions. The players have possibilities to trigger the samples (e.g with pedals) and experience more timing flexibility with it. To sync the live-parts with the fixed media, the click-tracks and a visual metronome are provided as a patch or an aid-program. Ensemble size: preferable 4 singers, light amplified to achieve a good balance with the fixed media parts. A bigger ensemble is conceivable, please pay attention to some typical solo-passages and apply than divisi. (in order of appearance in score: orchestral cymbals, snare, low floor tom* (N.B. sometimes covered with a cloth) or bass drum with pedal, rain stick small, orchestra bells*, kalimba or mbira, beat ring, triangle, woodblock, medium tam tam* with an iron peg and a t.t. beater, hi-hat or two orchestral cymbals hanged together, bongo`s, "Bird Call" (a toy from Audubon, check the link for more info: www.audubon-birdcall.com), a plate of multiply (three-ply) ca. 150 x 100 cm, Also the second percussionist needs a rough iron chain (rough chain links), a nylon fishing line and a metal plate ca. 100 x 100 cm x 0,4 cm (or thicker), please take a look at pages 4 and 5 for more useful information. At first sight the instrumentation below can be interpreted as a double string quartet, still not all parts are systematic doubled. It is more an ensemble, with its own subgroups and its own parts. Therefore it's a perfect idea to perform this work with a chamber orchestra (without CB's). In the "chamber orchestra" version, please take care of some typical solo passages and therefore perform these musical thoughts with lesser instrumentation. Tenor or baritone is conceivable as well, in that case apply the 8va bassa.